The classic symptoms of achilles tendinopathy are in the body of the tendon and are caused by the tendon having to do too much in terms of the tensile loading, that is the frequency that the tendon is being asked to do it’s job, transferring force is too high. This can be caused by too much mileage, too many interval/high intensity sessions or a combination of both. The other area is where you can feel the pain of achilles tendinopathy is around where it inserts into your heel. This is caused by a compressive overload where the tendon is being pulled against the heel as you go into dorsi flexion, the point where you are pushing off. 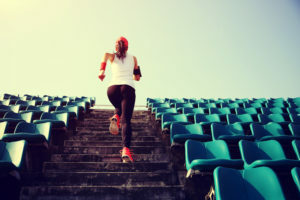 This tends to be caused where there has been a sharp increase in the volume of hill reps being done, though suddenly finding yourself running in a very hilly area could cause it be it more runs over hilly terrain. Prevention is far better than a cure so this brings us back to Tim Gabbett’s ideas around load management and when making changes to your training plan avoiding big jumps in overall volume and in the addition of higher intensity sessions, less is more in the long run. Giving your body the chance to adapt will mean that you can tolerate the greater volumes and intensities later in the program. Rest Days. You need to ensure that you are getting your rest in and “recovery runs” are pretty much a complete misnomer from this point of view. Easy runs are important but they don’t take the place of actual rest. In part due to the repetitive nature of endurance sports having 2 clear rest days has a massive impact on the chances of injury, reducing it by a factor of 5 as highlighted here. The addition of strength training is pretty much essential if you are serious about prevention. Any form of calf raise is going to be beneficial but given the role of the soleus in achilles problems some form of seated calf raise is a must and if you have access to one at the gym I would suggest that you make use of it. If you don’t then there is a great option in the video at the bellow. Peter Malliaras goes into why you should use it here in a lot more detail but the basics are that the soleus forms the biggest portion of the calf, with the two gastroc heads splitting the rest, and does the brunt of the work dealing with forces that are 3-3.5 times greater than those in the gastroc. You also need to ensure that the hamstring and glutes and strong enough for the job in hand. This is an aspect that we pay a lot of attention to with all our achilles clients and what Dave O’Sullivan of ProSport Academy calls posterior knee stability. What we are looking at is the ability of the hamstrings and gastroc etc to transfer force well. The primary roll of these two in gait is to transfer force and if they aren’t working well then we are likely to see issues above and below. What if you have pain in the tendon? A lot depends on the severity of the problem and in all cases there is a need to remember that even though the pain has gone/reduced that there will be a period where the tendon will still be sensitive to the load placed on it. As such the return to normal levels of activity should be a gradual one to allow the tendon to adapt to the gradually increasing load. 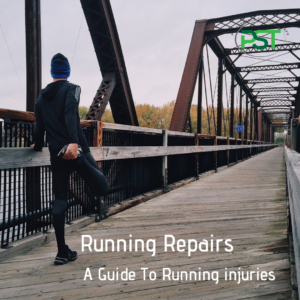 In mild cases and where the tendon is still in the reactive phase simply allowing 24-48 hours between runs is often enough to ensure that it is possible to continue running pain free whilst getting the rehab process going. Isometric exercise is useful all stages as it helps both reduce pain and build strength. To perform an isometric exercise you do not move but work to hold a position so with that in mind you could stand on a step as though you were going to perform a heel raise but hold the starting position and not move up or down. In more chronic cases achilles tendinopathy of ac we can still see elements of the reactive stage as the tendon will have areas that are normal as well as those which are degenerating. Rest is again a big part of the equation and making sure that you allow enough rest between activities that stress the tendon to allow it to recover and you to move with reduced/no pain. For anyone running higher mileages it would be worth looking at other forms of training during this period, certainly for longer duration work, to allow you to exercise but off load the tendon but still maintain your fitness. The rehab process for both forms of achilles tendinopathy include seated calf raises, 2-3x per week is often enough to help here, looking to add weight when suitable. If we are dealing with insertional rather than mid portion tendinopathy then initially these are done with a partial range of movement and gradually increasing the depth as tolerated. In doing this we avoid the compressive element on the movement in the initial stages. As we move from lower load activities like the seated calf raise and hammie bridge to higher load activities like ankling and hopping. Progressing from gentle foot to foot hoping to short single leg hops to longer ones, multi directional hopping and hopping where the focus is on learning to decelerate well. With the later stage tendinopathy, especially with athletes who are 40+, we are often looking at a long term management of the issue due to the changes that have occurred in the tendon and as such it is important to recognise the things that may set things off and aggravate it for you. Previous PostPrevious The best recovery tool in the world.